Almost perfect conditions in our bay today as we set off in search of the marine big 5. As we journeyed through the shallows, one of skippers found us two Indian Ocean Humpback Dolphins in the surf. 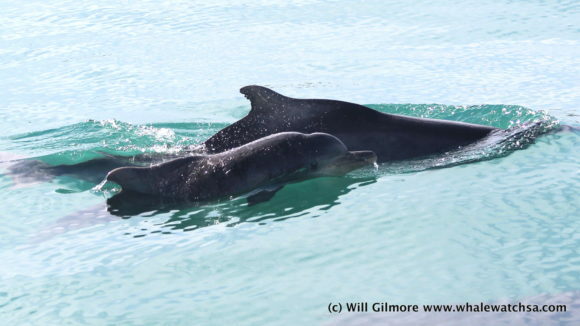 This species of dolphin is the rarest cetacean in South African waters, numbering less than 500 individuals. As we were watching the dolphins, we spotted a dark shadow just under the surface, a free-swimming great white shark. As we continued to cruise with the shark it became clear that the dolphins were mocking the shark, trying to force it out the area. It soon became clear why the two dolphins were displaying this behaviour, further down the beach we spotted more humpback dolphins including a mother and calf. 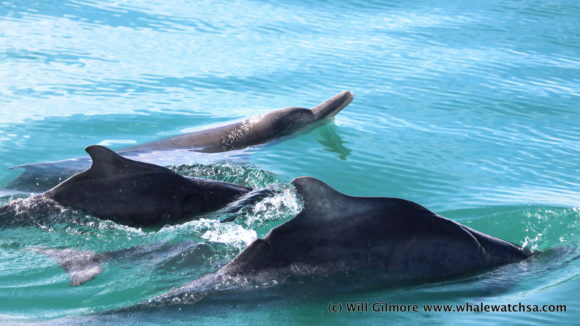 The dolphins were working together to protect the calf and mother from a possible shark attack. 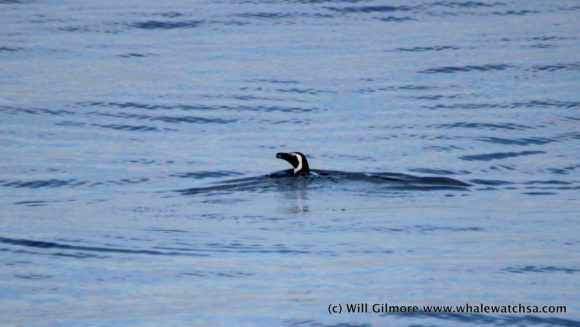 With this awesome sighting, we moved on towards the island to see what else our ecosystem had instore for us. Just before we arrived at the island, we were stopped by two little African penguins. It is always awesome seeing these birds swimming freely, unfortunately, when in small groups then can be a skittish around the boat. 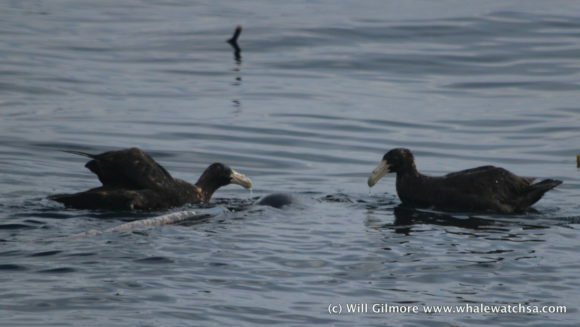 Fortunately for us, due to the amazing conditions, we were able to spot them quite easily when they surfaced. 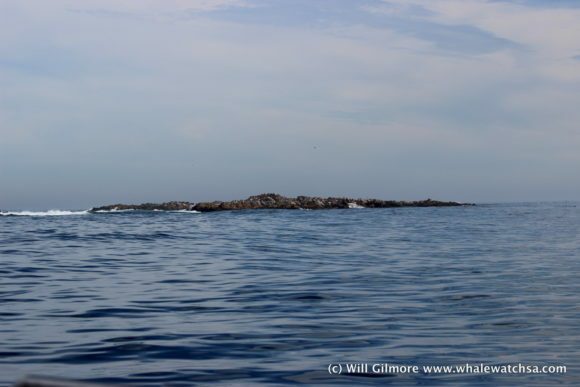 Not to stress out the penguins, the tour continued towards Dyer Island. 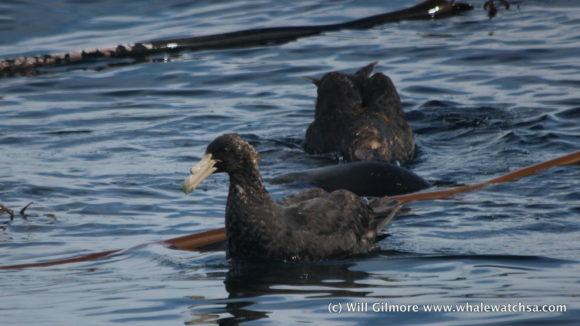 In the mouth of the alley, a huge number of giant petrels were floating on the surface, as we slowly approached the birds, it became obvious they were scavenging on a dead seal. These birds are often seen in large numbers when food is around. 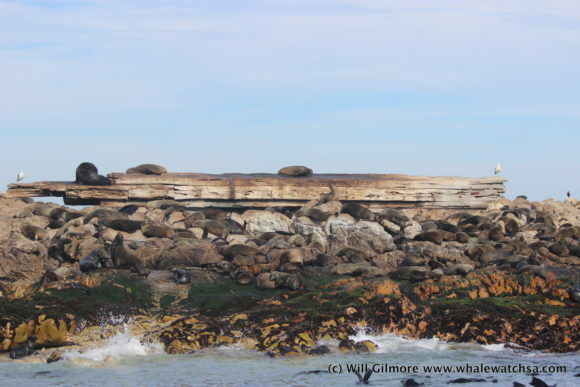 After witnessing mother nature take place, we moved towards the massive seal colony on geyser rock, the fourth largest in southern Africa, home to 60,000 cape fur seals. This was to be our last sighting of the day as the deep sea was again quite empty.